In the Middle Ages there was a tradition that Bartholomew was flayed - that is, his skin was removed from his body before he was martyred. 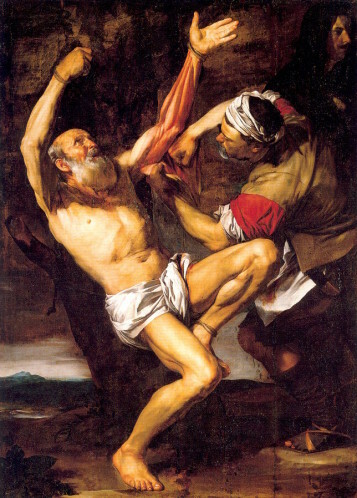 Summary: St Bartholomew, Apostle. Named in the list of apostles and generally identified with Nathaniel of Cana, the “Israelite without guile” (John 1:47) who was led to Jesus by the apostle Philip (3 May). Said to have preached the gospel in India and in Armenia, where tradition indicates he was martyred. 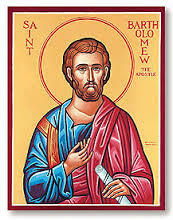 Bartholomew is identified with Nathanael, from Cana in Galilee. Bartholomew appears to be a family or surname, formulated with reference to the father’s name. It means “the son of Tolmay”.He is said to have preached the gospel in India or Armenia. An extraordinary tradition for the Middle Ages led to his being regarded as the patron saint of tanners. Patrick Duffy explains what is known about him. Traditionally, Bartholomew is identified with Nathanael: a name that means “God has given”. Nathanael was from Cana (Jn 21:2) and therefore may have witnessed the great “sign” made by Jesus in that place when the water was changed into wine (Jn 2:1-11). in whose spirit is no guile”. The reference seems to startle Nathanael: is there a suggestion that his meeting with Jesus is a conversion experience, that his sin is no longer held against him? Is he startled that Jesus knows so much about him, his inner thoughts: “How do you know me?” he asks. Jesus promises Nathanael that like Jacob in his dream, he will have an even greater revelation of the mystery of God: “You will see heaven laid open and, above the Son of Man, the angels of God ascending and descending”. The historian Eusebius in the fourth century reports that Bartholomew went to India. Another tradition locates him on apostolic activity in Armenia. In the Middle Ages there was a tradition that Bartholomew was flayed – that is, his skin was removed from his body before he was martyred. In the bottom corner of Michelangelo’s Last Judgment painting on the wall of the Sistine Chapel St Bartholomew is depicted holding the knife of his martyrdom and his flayed skin. 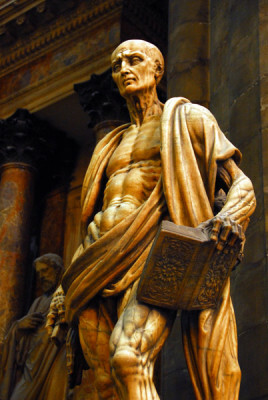 Also in Milan Cathedral (see image right) there is an extraordinary statue by Marco d’Agrate of St. Bartholemew draped with his own skin (1562). He has been referred to the patron saint of tanners!